Kidney stones are one of the most painful disorders to afflict humans. This ancient health problem has tormented people throughout history. Scientists have even found evidence of kidney stones in an Egyptian mummy estimated to be more than 7,000 years old. Kidney stones are one of the most common disorders of the urinary tract. More than one million cases of kidney stones were diagnosed in 1985. It is estimated that 10 percent of all people in the United States will have a kidney stone at some point in time. Men tend to be affected more frequently than women. Most kidney stones pass out of the body without any intervention by a physician. Cases that cause lasting symptoms or other complications may be treated by various techniques, most of which do not involve major surgery. Research advances also have led to a better understanding of the many factors that promote stone formation. Narrow tubes called ureters carry urine from the kidneys to the bladder, a triangle-shaped chamber in the lower abdomen. Like a balloon, the bladder’s elastic walls stretch and expand to store urine. They flatten together when urine is emptied through the urethra to outside the body. A kidney stone develops from crystals that separate from urine and build up on the inner surfaces of the kidney. Normally, urine contains chemicals that prevent or inhibit the crystals from forming. These inhibitors do not seem to work for everyone, however, and some people form stones. If the crystals remain tiny enough, they will travel through the urinary tract and pass out of the body in the urine without even being noticed. Kidney stones may contain various combinations of chemicals. The most common type of stone contains calcium in combination with either oxalate or phosphate. These chemicals are part of a person’s normal diet and make up important parts of the body, such as bones and muscles. A less common type of stone is caused by infection in the urinary tract. This type of stone is called a struvite or infection stone. Much less common are the uric acid stone and the rare cystine stone.  Urolithiasis is the medical term used to describe stones occurring in the urinary tract. Other frequently used terms are urinary tract stone disease and nephrolithiasis. Doctors also use terms that describe the location of the stone in the urinary tract. For example, a ureteral stone (or ureterolithiasis) is a kidney stone found in the ureter. To keep things simple, the term “kidney stones” is used throughout this entire document. Gallstones and kidney stones are not related. They form in different areas of the body. If a person has a gallstone, he or she is not necessarily more likely to develop kidney stones. For some unknown reason, the number of persons in the United States with kidney stones has been increasing over the past 20 years. White people are more prone to kidney stones than are black people. Although stones occur more frequently in men, the number of women who get kidney stones has been increasing over the past 10 years, causing the ratio to change. Kidney stones strike most people between the ages of 20 and 40. Once a person gets more than one stone, he or she is more likely to develop others. Doctors do not always know what causes a stone to form. While certain foods may promote stone formation in people who are susceptible, scientists do not believe that eating any specific food causes stones to form in people who are not susceptible. A person with a family history of kidney stones may be more likely to develop stones. Urinary tract infections, kidney disorders such as cystic kidney diseases, and metabolic disorders such as hyperparathyroidism are also linked to stone formation. In addition, more than 70 percent of patients with adequate hereditary disease called renal tubular acidosis develop kidney stones. Cystinuria and hyuperoxaluria are two other rare inherited metabolic disorders that often cause kidney stones. In cystinuria, the kidneys produce too much of the amino acid cystine. Cystine does not dissolve in urine and can build up to form stones. With hyperoxaluria, the body produces too much of the salt oxalate. When there is more oxalate than can be dissolved in the urine, the crystals settle out and form stones. Absorptive hypercalciuria occurs when the body absorbs too much calcium from food and empties the extra calcium into the urine. This high level of calcium in the urine causes crystals of calcium oxalate or calcium phosphate to form in the kidneys or urinary tract. Other causes of kidney stones are hyperuricosuria (a disorder of uric acid metabolism), gout, excess intake of vitamin D, and blockage of the urinary tact. Certain diuretics (water pills) or calcium-based antacids may increase the risk of forming kidney stones by increasing the amount of calcium in the urine. Calcium oxalate stones may also form in people who have a chronic inflammation of the bowel or who have had an intestinal bypass operation, or ostomy surgery. As mentioned above, struvite stones can form in people who have had a urinary tract infection. Usually, the first symptom of a kidney stone is extreme pain. The pain often begins suddenly when a stone moves in the urinary tract, causing irritation or blockage. Typically, a person feels a sharp, cramping pain the back and side in the area of the kidney or in the lower abdomen. Sometimes nausea and vomiting occur with this pain. Later, the pain may spread to the groin. Sometimes “silent” stones — those that do not cause symptoms — are found on x-rays taken during a general health exam. These stones would likely pass unnoticed. More often, kidney stones are found on an x-ray, CT scan, or sonogram taken on someone who complains of blood in the urine or sudden pain. These diagnostic images give the doctor valuable information about the stone’s size and location. Blood and urine tests help detect any abnormal substance that might promote stone formation. The doctor may decide to scan the urinary system using a special x-ray test called an IVP (intravenous pyelogram) or CT scan. Together, the results from these tests help determine the proper treatment. IVP x-rays will miss some stones. CT scan will often call things stones that are not. Occasionally a patient will need both an IVP and CT scan or a repeat of the first test to confirm the presence of stones. Fortunately, most stones can be treated without surgery. Most kidney stones can pass through the urinary system with plenty of water (2 to 3 quarts a day) to help move the stone along. In most cases, a person can stay home during this process, taking pain medicine as needed. The doctor usually asks the patient to save the passed stone(s) for testing. People who have had more than one kidney stone are likely to form another. Therefore, prevention is very important. To prevent stones from forming, their cause must be determined. The urologist will order laboratory tests, including urine and blood tests. He or she will also ask about the patient’s medical history, occupation and dietary habits. If a stone has been removed, or if the patient has passed a stone and saved it, the lab can analyze the stone to determine its composition. A patient may be asked to collect his or her urine for 24 hours after a stone has passed or been removed. The sample is used to measure urine volume and levels of acidity, calcium, sodium, uric acid, oxalate, citrate, and creatinine (a byproduct of protein metabolism). The doctor will use this information to determine the cause of the stone. A second 24-hour urine collection may be needed to determine if the prescribed treatment is working. A simple and most important lifestyle change to prevent stones is to drink more liquids — water is best. A recurrent stone former should try to drink enough liquids throughout the day to produce at least 2 quarts of urine in every 24-hour period. Patients with too much calcium or oxalate in the urine may need to eat fewer foods containing calcium and oxalate. Not everyone will benefit from a low-calcium diet, however. Some patients who have high levels of oxalate in their urine may benefit from extra calcium in their diet. Patients may be told to avoid food with added vitamin D and certain types of antacids that have a calcium base. Patients who have a very high level of acid in their urine may need to eat less meat, fish, and poultry. These foods increase the amount of acid in the urine. To prevent cystine stones, patients should drink enough water each day to reduce the amount of cystine that escapes into the urine. This is difficult because more than a gallon of water may be needed every 24 hours, a third of which must be drunk during the night. The doctor may prescribe certain medications to prevent calcium and uric acid stones. These drugs control the amount of acid or alkali in the urine, key factors in crystal formation. The drug allopurinol may also be useful in some cases of hypercalciuria and hyperuricosuria. Another way a doctor may try to control hypercalciuria, and thus prevent calcium stones, is by prescribing certain diuretics, such as hydrochlorothiazide. These drugs decrease the amount of calcium released by the kidneys into the urine. Some patients with absorptive hypercalciuria may be given the drug sodium cellulose phosphate. This drug binds calcium in the intestine and prevents it from leaking into the urine. If cystine stones cannot be controlled by drinking more fluids, the doctor may prescribe the drug Thiola. This medication helps reduce the amount of cystine in the urine. For struvite stones that have been totally removed, the first line of prevention is to keep the urine free of bacteria that can cause infection. The patient’s urine will be tested on a regular basis to be sure that bacteria are not present. If struvite stones cannot be removed the doctor may prescribe a new drug called aetohydroamic acid (AHA). AHA is used along with long-term antibiotic drugs to prevent the infection that leads to stone growth. To prevent calcium stones that form in hyperparathyroid patients, a surgeon may remove all of the parathyroid glands (located in the neck). This is usually the treatment for hyperparathyroidism as well. In most cases, only one of the glands is enlarged. Removing the gland ends the patient’s problem with kidney stones. • has grown larger (as seen on follow up x-ray studies). Until recently, surgery to remove a stone was very painful and required a lengthy recovery time (4 to 6 weeks). Today, treatment for these stones is greatly improved. Many options exist that do not require major surgery. Extracorporeal shockwave lithotripsy (ESWL) is the most frequently used surgical procedure for the treatment of kidney stones. ESWL uses shockwaves that are created outside of the body to travel through the skin and body tissues until the waves hit the dense stones. The stones become sand-like and are easily passed through the urinary tract in the urine. There are several types of ESWL devices. One device positions the patient in the water bath while the shock waves are transmitted. Other devices have a soft cushion or membrane on which the patient lies. Most devices use either x-rays or ultrasound to help the surgeon pinpoint the stone during treatment. For most types of ESWL procedures, some type of anesthesia is needed. In some cases, ESWL may be done on an outpatient basis. Recovery time is short, and most people can resume normal activities in a few days. Complications may occur with ESWL. Most patients have blood in the urine for a few days after treatment. Bruising and minor discomfort on the back or abdomen due to the shockwaves are also common. To reduce the chances of complications, doctors usually tell patients to avoid taking aspirin and other drugs that affect blood clotting for several weeks before treatment. In addition, the shattered stone fragments may cause discomfort as they pass through the urinary tract in the urine. In some cases, the doctor will insert a small tube called a stent through the bladder into the ureter to help the fragments pass. Sometimes the stone is not completely shattered with one treatment and additional treatments may be required. Sometimes a procedure called percutaneous nephrolithotomy is recommended to remove a stone. This treatment is often used when the stone is quite large or in a location that does not allow effective use of EWSL. One advantage of percutaneous nephrokithotomy over ESWL is that the surgeon removes the stone fragments instead of relying on their natural passage from the kidney. Although some ureteral stones can be treated with ESWL, ureteroscopy may be needed for mid- and lower ureter stones. No incision is made in this procedure. Instead, the surgeon passes a small fiberoptic instrument called a ureteroscope through the urethra and bladder into the ureter. The surgeon then locates the stone and either removes it with a cage-like device or shatters it with a special instrument that produces a form of shockwave (EHL) or with a laser device . A small tube or stent may be left in the ureter for a few days after treatment to help the lining of the ureter heal. Is There Any Current Research on Kidney Stones? The Division of Kidney, Urologic, and Hematologic Diseases of the National Institutes of Diabetes and Digestive and Kidney Diseases (NIDDK) funds research on the causes, treatments, and prevention of kidney stones. The NIDDK is part of the Federal Government’s National Institutes of Health in Bethesda, Maryland. Why do some people continue to have painful stones? How can doctors predict, or screen, who is as risk for getting stones? What are the long-term effect?